Star Wars: The Last Jedi did something that no other Star Wars film has done since 1980 – it surprised me. My adoration for this Saga is unlimited, but I didn’t think it could still do that. The Force Awakens is so much a note-for-note cover of the original film that, while it’s still entertaining, you can see the turns of the plot from a few parsecs away. But almost immediately, writer/director Rian Johnson throws out the template from the previous films and goes straight into uncharted territory. It’s still very much Star Wars, but not as beholden in tone and pace to the previous films. Because of that, The Last Jedi works best when you aren’t trying to crack open the plot and instead just allow the film take you where it wants to take you. To that end, The Last Jedi is a whopping two hours and thirty minutes long, and at times, yes, you feel it. But in that good way, the way you do when spending time with friends that you care about. Not just the old characters we know and love like Luke, Leia, Chewie, or C-3PO, and not just these new additions like Rey, Poe, Finn, and Kylo Ren, but characters like Kelly Marie Tran’s Rose, or Laura Dern’s Vice Admiral Holdo, or Benicio Del Toro’s DJ. Everyone has a great moment to shine, and everyone’s story is full of urgency and importance. The stakes in The Last Jedi have never been higher, and that is saying something in a franchise that destroys entire planets from time to time. There are moments in The Last Jedi that it is entirely unclear whether or not our heroes will make it out alive, much less succeed. An awful lot happens this time around, and during crucial moments, I wasn’t sure where this story would go next, which I found to be incredibly exciting. Let’s get down to it – this is Mark Hamill’s best performance as Luke Skywalker, bar none. This is a Jedi Master weary of wars and battles, and of seeing loved ones die or be consumed, and Hamill puts it all in his eyes. He is a broken man when Rey finds him on that island, and not the hero of legend and lore that Rey always believed. Hamill, in his first moments onscreen, made me audibly gasp at some of the choices that he and Rian Johnson make with the character. (I gasped a lot at The Last Jedi.) There’s something reminiscent of Clint Eastwood’s world-weary gunslinger in Hamill’s work here, but having seen the idealistic, brave Jedi Knight in films past, the places Hamill takes Skywalker in The Last Jedi are shocking and unsettling. It’s a brave performance, and I give Mark Hamill the highest marks for what he’s done. Star Wars films aren’t generally known for their acting caliber, but (and this may just be hyperbole talking) I wouldn’t mind seeing some awards push for Mark Hamill here. No less compelling is Carrie Fisher as General Leia Organa, wracked with guilt and grief over the death of Han Solo and the monster her son, Ben Solo/Kylo Ren, has become. Leia, through all her pain and struggle, still must make the hard choices that will push the Resistance forward. The loss of Carrie Fisher last year fills many of her scenes with sadness and melancholy, and there will be many tears shed over her work here, no doubt. But this is also some of the strongest work she’s ever done in the character. She shows us all what true leadership is, the risks and heartbreak that are involved, and Fisher reminds us all of how great an actress she was when she was given good material. Rian Johnson gives both Luke and Leia the proper attention and respect, and it’s not just based on nostalgia for their other Star Wars films, either. Hamill and Fisher are given rich opportunities to explore Luke and Leia in unexpected, rich emotional ways. Daisy Ridley as Rey is given even more to do than in The Force Awakens. We expect Rey to take the route that we’ve seen from characters like hers in the other films, but, again, Rian Johnson and Daisy Ridley play with those expectations and take us to places we do not expect. The same goes for Adam Driver’s performance as Kylo Ren, a man who is unhinged, lost, and searching for any way he can to find his own place in the galaxy. The nature of Rey and Kylo’s relationship in The Last Jedi is best revealed in the film, but both Ridley and Driver fill their characters with uncertainty, fear, and not a little anger. Both Rey and Kylo are being manipulated by outside forces beyond their control, and both strain against the boundaries that their destinies have placed them inside. John Boyega’s Finn is no less restrained, and Finn must figure out a way to help Rey and the Resistance in their time of dire need. To that end, Finn gets the help of Rose (Kelly Marie Tran), a Resistance tech who wants to prove herself among all these heroes and legends. Boyega and Tran have nice chemistry together, and I loved their desperate act to stop the First Order, which pays off in a couple of rollicking action sequences. Oscar Isaac’s Poe Dameron gets, hands down, the funniest moment of the film (and there are quite a bit of those – The Last Jedi may be the funniest film of the Saga in a lot of ways), and he also is forced to make decisions and compromises that go against what he believes to be right. Most of those conflicts are between Poe and Vice Admiral Holdo (Laura Dern), a leader who on the surface does not seem to have the best interests of the Resistance at heart, at least to Poe’s understanding. The Last Jedi has many moments that subvert expectations, and considering that these are expectations that have been built up for many years now, I have to give credit, again, to Rian Johnson, a director steeped in film knowledge but someone who also knows how to apply that knowledge to tell a compelling story. The Last Jedi isn’t afraid to play with some of the more political themes and ideas of the day, either, which makes the film that much richer in context and power. Star Wars films were always like that; even the first one was a reaction to the Nixon years. Even the Prequels did it; while they might not have been entirely successful, the story of how a democratic government was twisted by a fascist despot is all in there. The Last Jedi has a lot to say about heroism, our ideals, and how we can fail to live up to them. This isn’t empty spectacle, and at its best, Star Wars always had more on its mind than its detractors gave it credit for – how the bonds of friendship and family are tested by strife and war, or how a government could be consumed with power-hungry leaders, or how blind faith can sometimes steer people down the wrong path. There is a morality to these films that shouldn’t be dismissed, and Rian Johnson takes what we know about that morality and puts it through the test, and thus, the audience is put to the test as well. John Williams’ score this time around is better than The Force Awakens – he gives everything the proper scope and grandeur. The action sequences of The Last JediI are some of the most exciting we’ve seen yet in the Saga. This isn’t as simple as destroying a space station – instead, everyone is fighting for their very lives, and because the stakes are so high, we become even more invested than before. This is not a film that pulls punches. People die, and we feel those losses acutely. Even in previous films of the Saga, we never felt as connected to them as we do in The Last Jedi. There is a propulsion and intensity that will likely put audiences at the edges of their seats. Johnson keeps everything thrilling and exciting, but fills those moments with power and emotion. You may find yourself tearing up at the grand scale of all of it. Rian Johnson manipulates us in all the best cinematic ways. There are moments to cheer, moments of tears, moments that cause us to gasp for breath, and moments where we are genuinely afraid for our heroes. 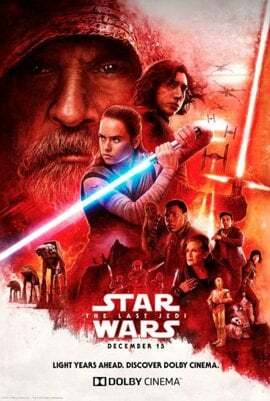 As with the serial adventures of yesteryear, Star Wars: The Last Jedi fills its screen with the possibilities of adventure, spirit, and rich emotional storytelling. This is the most exciting Star Wars film in years – dangerous, unpredictable, and powerful. At the end of The Last Jedi, I was left in the same place that I was that fateful day in May, 1980, when the universe I thought I knew had been upended and everything was left in chaos. While The Last Jedi isn’t similar to The Empire Strikes Back in plot, it is very close to it in terms of the emotion and the power on display. This is going to be an excruciatingly long two years to wait. Until then, we have been given a remarkable gift, those of us who have been fans since 1977 – we cannot wait to find out what happens next. This is my favorite Star Wars film, and that is saying something.